Crock Pot Tater Tot Casserole is one of my family’s favorite slow cooker meals! It’s loaded with ground beef and cheese and an easy way to please everyone at your table! We love using our Crock Pot to make dinner time a little easier. Especially, by making Mexican Casserole and Crockpot Ground Beef Stroganoff. 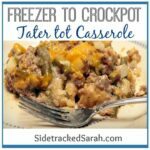 One thing you will notice with my freezer to crockpot meals and especially this Cheesy Crockpot Tater Tot Casserole is that they are easy to make last minute if you have the right ingredients on hand. 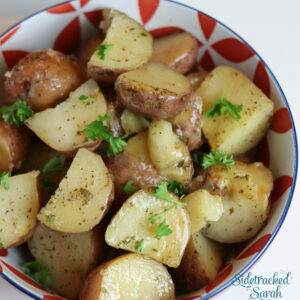 I have quickly whipped this one up really for a potluck dinner after church and have baked it in the oven, but I LOVE throwing it in the slow cooker. Can I Substitute Hash Browns for Tater Tots in Tater Tot Casserole? Yes, that should work just fine. Since they’ll be a little more dense, you may need to decrease the amount of potatoes you add. 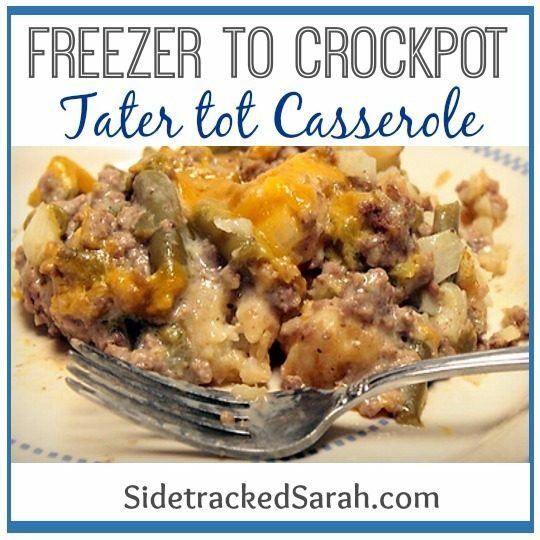 Do You Have to Freeze Crock Pot Tater Tot Casserole? Because I specialize in Crockpot Freezer Meals, I love sharing how to make your recipes ready for the freezer, especially when it’s simple. It sure helps when you have a few of these easy meals thrown together in the freezer for you to pull from when your life is in chaos mode, like mine! We first heard of it and tried the recipe that was given to us from another large family. Since that time, several other large families have mentioned it’s a staple in their home as well. The recipe was passed around as an easy meal to serve that would stretch and feed many. We also saw that a famous reality TV show had shared the recipe as well. After a little research, we discovered that tater tot casserole originates in the Upper Midwest region of the United States, where it remains popular to this day. Particularly in Minnesota, South Dakota, Wisconsin, and North Dakota. Mix together all ingredients, except tater tots and cheese. Place tater tots in slow cooker. Pour ground beef mixture over top. Cook on low in slow cooker. Top with cheese once done cooking. Enjoy all the comments your family gives on how great this dish is! Crockpot Meals made with Ground Beef! Crock Pot Tater Tot Casserole is one of my family's favorite slow cooker meals! It's loaded with ground beef and cheese and an easy way to please everyone at your table! Mix together cooked ground beef, onion, cream soups, milk, salt, pepper, and green beans. Line crockpot with tater tots. Poor ground beef mixture over the top of the tater tots. Cook on low for 6-7 hours or on high for 3. Mix together all ingredients except cheese and tater tots and place in a gallon size freezer safe bag. Follow instructions above to cook. My family likes to eat ketchup on this. Here it is, ready to go in the freezer. Don’t forget that you can also get a one week menu for free by subscribing by email, too! You can subscribe up in the sidebar…. Hello! I just realized that I don’t have any tater tots, but I do have a bag of shredded hash browns. Can I use that in leiu of the tots? Yes hashbrowns would also work just fine. Awesome recipe. My hubby is extremely picky. Would have never dreamed it would end up being one of our favorites. Do you drain the green beans? Well that explains what I did wrong. Still good but extremely runny. This is also very good when putting mashed potatoes on top like Shepherd’s pie. This looks delicious! How many people does it typically feed? It feeds 8 of us, but that would mean about 6 adult sized eaters as we have a few small eaters. I’m looking forward to trying this. We are a very busy household with three kids. Though I wont use mushroom soup… maybe with cream of chicken. Thank you for the wonderful idea. I often don't use the mushroom soup either. We switch for cream of chicken soup regularly. I have ,made this twice though never freezing the meat mix beforehand. Love it! I am considering trying this out for the children in my daycare for lunch. Do you think I could cook it on high for a lower amount of time? I really don’t want to be getting up at 5am to put it in the slow cooker. I have two who go to school and need to eat at 11:30. I think if it has 3 hours on high it will be fine. made this but something must’ve gone wrong because there were no tots to be seen. I followed directions exactly as I do the first time with a new recipe, but this turned into a mash. The flavor was there and was good, but it looked like mush with green beans – you could not see a tater tot, altho you could taste them. What is wrong here? Maybe try buying the extra crispy ones? Ours usually turns pretty mushy as well…..I think that's how it's supposed to be. If you prefer the tots to stay in tact, try buying the extra crispy ones or crisping them in the oven before you put them in the bottom of the pan. Is this good with cream of chicken instead of mushroom? Yes, it's very good with any cream soups. I mix and match as I see fit all the time. Can I skip the freezing part and just make the recipe? Sure, that'll work great. I do that sometimes. Can you switch out the green beans for corn? My kids refuse to eat green beans? Sure, I think that would work just fine. Great idea to throw some good nutrition in there! I've been making something similar only I use Cream of Celery instead of cream of muchroom and a can of Veg-All instead of green beans. But I haven't tried it in the crock-pot, think I will next time. Should the tots be frozen or thawed at the start of cooking? They should be frozen. I hope that helps! Thanks for this post. My mother in law showed me how to make this delish meal a long time ago. It is a family favorite. We've not tried it in the crockpot yet. I used to freeze the browned beef and soup though. Just to help when kids were little and the first real cooking my girls learned was browing the beef for this dish. I'm really liking your site too. You're welcome! I love it when the kids are old enough to help out with some of it! Do you think it will be ok cooking low for 8 hours instead of 6? Yes, you can do that. It may be a bit crispier around the edges….but it should be OK.
Hey, Sarah! I found your site while looking for a Crockpot TaterTot recipe. I recognized your picture, and thought it was neat to find my MOMYS friend! Thanks for stopping by and saying something Rebecca! Blessings to you, too! That's a great tip Cindi. Thanks for sharing! Just a tip on freezing stuff for the crockpot. Store the ingredients in a round, plastic, container that fits inside the crockpot. When you are ready to use the ingredients just run the container, upside, down under hot water. Be sure the lid is tight so you don't get water inside and the contents don't fall out before you are ready for them. Hi Sara, so glad you stopped by! Glad you got some time to browse while your baby is napping….my 6 month old has not been wanting to take a nap lately!